Joshua Tree, originally uploaded by yathin. Max. age - up to 250 years. 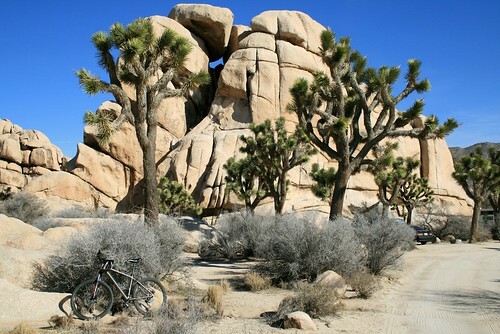 rock trees bike, originally uploaded by Katherine H.
Joshua Tree National park named after this tree. Within the park the Mojave desert is the prime habitat of the Joshua tree. 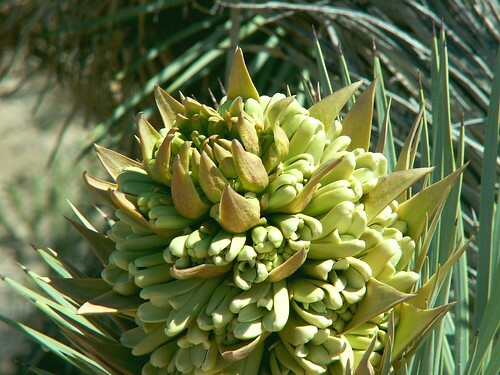 Pollinated by the Yucca moth which lays its eggs in the trees flower. Joshua Tree Full Bloom from Zoom, originally uploaded by cobalt123. The name “Joshua tree” was given by Mormon settlers who likened the trees branches to a Biblical story of Joshua’s arms being raised to keep the sun from setting so that a battle could be won during the daylight. The Cahuilla Native Americans use this tree for as a source of material for crafts and also as a source of food from the seeds. Joshua Tree Branch, originally uploaded by john w.